This plant gets its name from the skunk-like odor it lets off to the entire surrounding area. The smell can even be noticed in very old, dried out specimens. The foul smell attract pollinators, beetles and other insects. It's found in damp areas such as swamps and wooded areas. 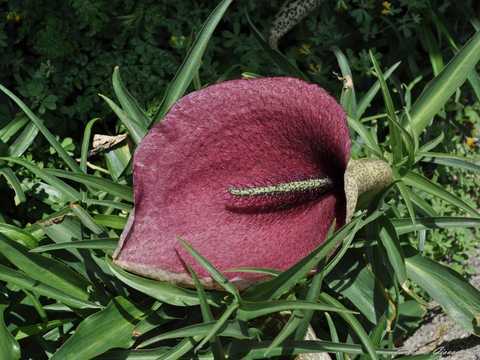 This large lily gives off a smell similar to a rotting carcass in order to attract Lucilia flies and other insects. The plant traps them for a full day and night then releases them with lots of pollen. Above the male flowers there is a ring of hairs that act as an insect trap. The pollinators get trapped and covered in the plant's pollen as they try to escape. All parts of the plant can cause an allergic reaction and some parts give off heat and odour to attract insects. This ornamental plant is native to the Mediterranean region and gives off a smell of carrion to attract blowflies and other insects. 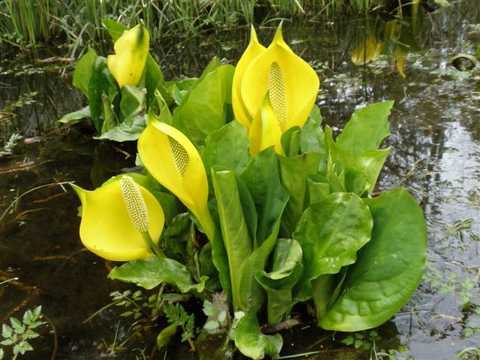 It is a rare thermogenic plant, which means it can raise its temperature to attract even more insects. This is a parasitic plant that grows on the roots of the Euphorbiceae species that grows underground in the deserts of South Africa. 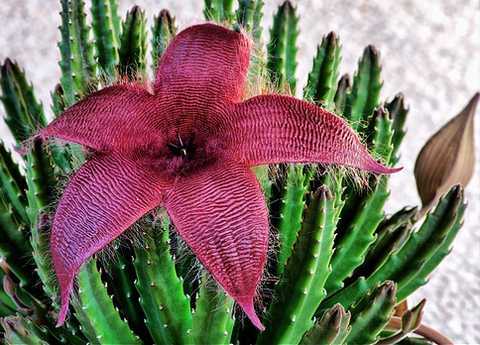 The flesh-colored flower emerges from the soil and gives off a smell of faces to attract pollinators such as dung beetles and carrion flies. The flower will trap the beetles that enter so they can cover themselves in pollen. Then when the flower fully opens again they are allowed to leave. These succulents grow amazing hairy flowers that give off the smell of rotting flesh. They blooms are very big and the larger the species the more pungent the scent. The hairs on the flower are there to resemble a layer of mould that grows on rotting meat. Blowflies act as pollinators and a lot of flies will actually lay their eggs inside the flower, as they would with a rotting carcass. There are a number of flowers that look and smell like rotting meat in order to attract insect that will pollinate them. A lot of species will trap the insects after luring them in, letting them go only when they have collected enough pollen. However, carrion flowers do not reward the insects that pollinate them with nectar like most other flowers. This tree is around six to eight metres tall and at the top branches out with loads of little flowers. 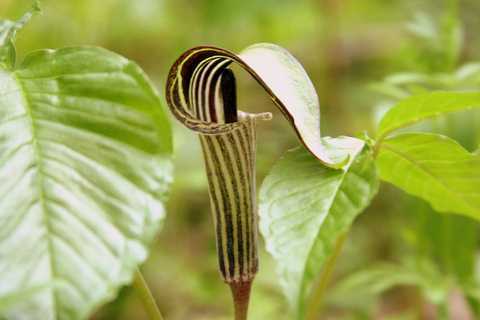 It only flowers once in its life span, when it is about 30 to 80 years old. It takes about a year for the flowers to become fruit and after fruiting it then dies. It smells sweet and the sap is used for palm wine. 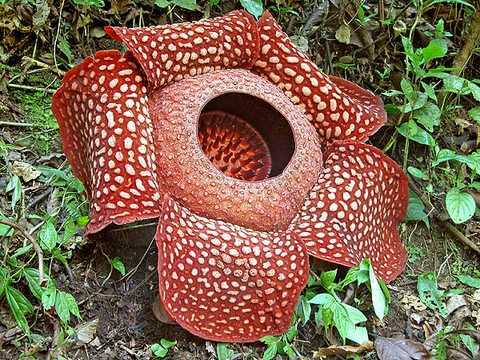 This is the largest flower in the world and it grows on the floor of rainforests. 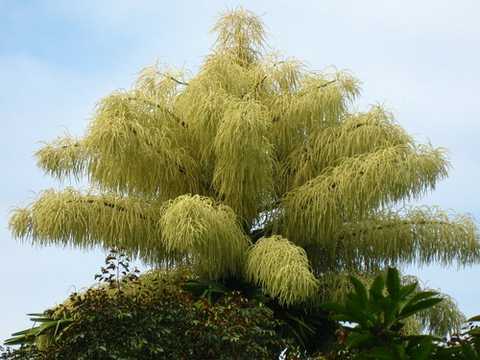 It does not have the usual parts such as leaves, roots or stem as other flowers because it does not need them. It gives off a stench of rotting flesh, which attracts carrion flies. Before it flowers it is almost invisible, it then grows into a cabbage-like plant that opens into the huge flower that only lasts for a few days. There is a lot that is not known about how the plants reproduce as scientists are struggling to recreate the environment in which the plant lives. Because of this, they have not been able to fully study them. 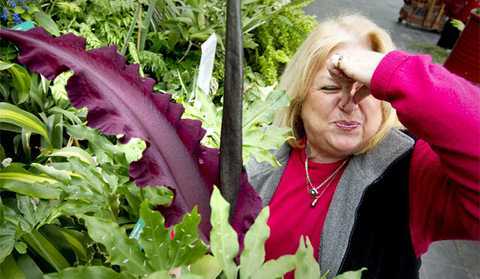 This huge plant is often referred to as the corpse flower. 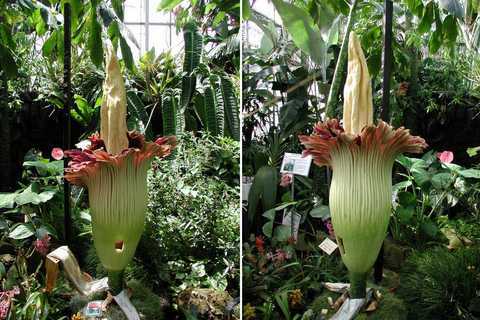 It's three metres tall when fully grown and emits a horrible stench that people flock to from around the world. It takes a long time to reach full size and when it gets there it will begin to heat up to somewhere around human body temperature. This helps to intensify its smell, which attracts pollinators. 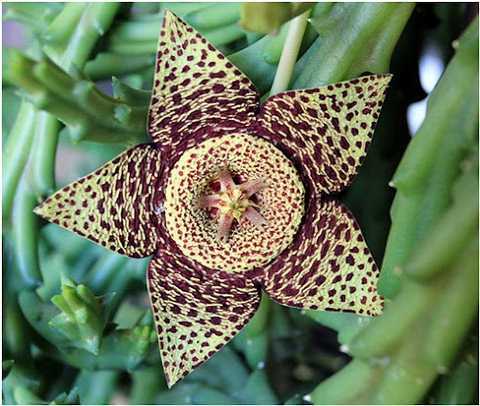 It can take years for the flower to bloom so when it does people visit to see the magnificent, and smelly, plant in action.